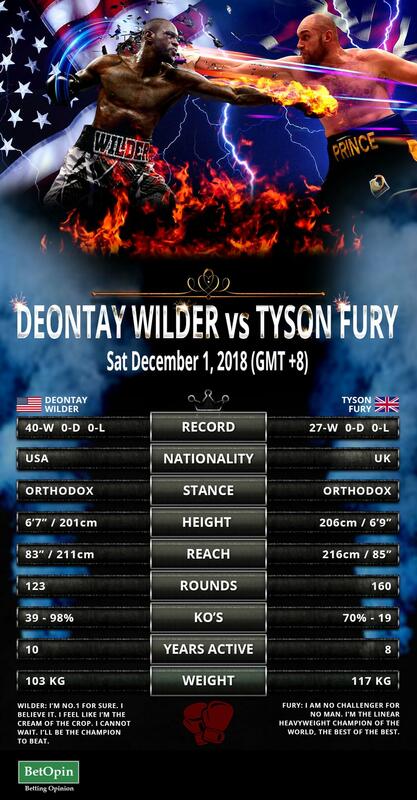 Tyson Fury and Deontay Wilder face off in the fight of the year on December 2nd in Los Angeles. The ‘Gypsy King’ made his comeback in June this year after a three-year absence and now faces the undefeated Wilder in what’s set to be an unmissable fight. We have made this unique infographic showing you how these two epic fighters compare. We’ve got the best boxing betting odds, stats and free bets for you in our Fury v Wilder Betting Preview. Betway are offering 11/8 for Tyson Fury to win the fight. New customers can get a £30 free bet with a minimum first deposit of £10. William Hill go 8/11 for Deontay Wilder to win and you’ll receive £30 in free bets when you bet £10 as a new customer. Mr Green are offering 6/5 on the total number of rounds being Under 9.5. They’ll give you €100 matched deposit bonus and 200 free spins on games. Coral offer 13/2 about Fury to win after being knocked down. New customers can get a £20 free bet when they bet just £5. Royal Panda go Wilder to win by decision or technical decision 10/3. 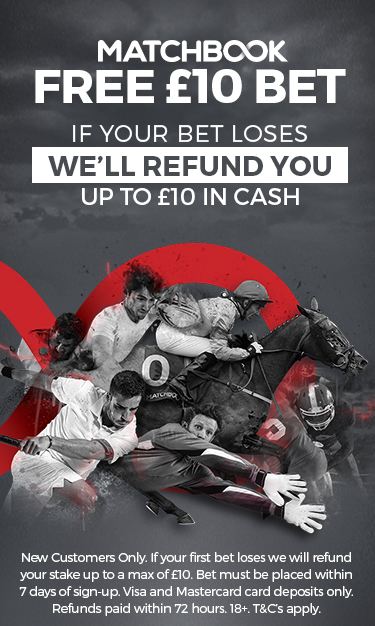 If you’re a new customer you can get a £20 free bet if you bet £20 with your first deposit. Ladbrokes have Fury to win on points at 9/4. Like Coral they’ll give you a £20 free bet when you bet just £5. Wilder’s impressive record of 40-0 with 39 of those victories coming by the way of knockouts gives you an insight into a glittering career that has spanned more than a decade. Fury himself has a perfect record of 27-0, which includes victory as an underdog against Wladimir Klitschko in 2015. With Fury averaging 53 punches per round, he is by far the busier of the two fighters. However, when it comes to accuracy Wilder connects with 41% of his total punches. These two contrasting stats give an insight into the type of fight we should expect on December 2nd. In the most anticipated fight this year it comes as no surprise that former professionals have been happy to give their predictions, Lennox Lewis says he can’t call the fight due to their contrasting styles. While David Haye says that Fury will have to “completely reinvent himself” if he is to get the better of Wilder. Bookies give Fury a 44% chance of winning which could be argued is a fair assessment of his chance. 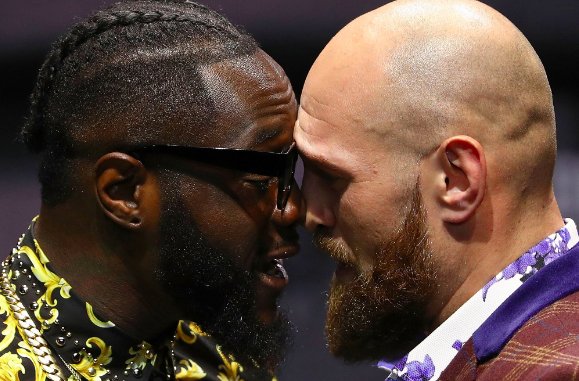 Wilder is rightly the favourite, but what is for sure is that with his perfect 27-0 record on the line, Manchester-born Fury will have left no stone unturned in his pursuit to become the first fighter to defeat Deontay Wilder. Freddie Roach, best known as trainer of Manny Pacquiao, and Ricky Hatton are to be in Tyson Fury’s corner for the fight. The experienced pair will join Fury’s rookie trainer Ben Davison, after he parted ways with his uncle Peter who led him to his most famous victory over Wladimir Klitschko in 2015. Theresa May Betting Odds – Has Her Time Come?